LLDebugToolSwift is the extension of LLDebugTool, it provide swift interface for LLDebugTool, LLDebugToolSwift will release with LLDebugTool at same time. If your project is a Objective-C project, you can use LLDebugTool, if your project is a Swift project or contains swift files, you can use LLDebugToolSwift. Choose LLDebugTool for your next project, or migrate over your existing projects—you’ll be happy you did! Fix LLWindow become keywindow’s bug. LLDebugTool supports component-based now. Now you can integrate only one or more modules into your own Debug debugger. You can directly use the view controller contained in each module, or just call the functions in Function folder and build UI yourself. How to use components, see WikiUse Components or Adding LLDebugTool to your project. More changes can be viewed in Version 1.2.2 Project. Update LLWindow.m and make [UIApplication sharedApplication].delegate.window become key window when LLWindow become key window. What can you do with LLDebugTool? Always check the network request or view log information for certain events without having to run under XCode. This is useful in solving the testers’ problems.. Easier filtering and filtering of useful information. Easier analysis of occasional problems. Easier analysis of the cause of the crash. Easier sharing, previewing, or removing sandbox files, which can be very useful in the development stage. 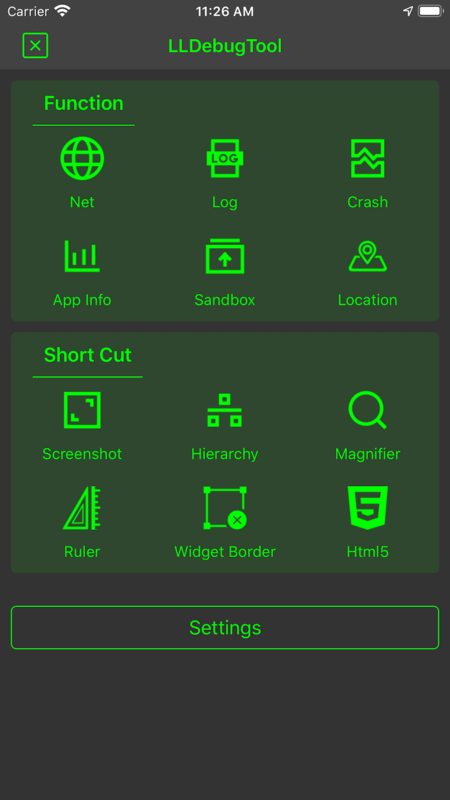 Easier observe app’s memory, CPU, FPS and other information. CocoaPods is the recommended way to add LLDebugTool to your project. Add a pod entry for LLDebugTool to your Podfile pod 'LLDebugTool' , '~> 1.0.0', If only you want to use it only in Debug mode, Add a pod entry for LLDebugTool to your Podfile pod 'LLDebugTool' , '~> 1.0.0' ,:configurations => ['Debug'], Details also see Wiki/Use in Debug environment. If you want to specify the version, use as pod 'LLDebugTool' , '1.2.2' ,:configurations => ['Debug']. Install the pod(s) by running pod install. If you can’t search LLDebugTool or you can’t find the newest release version, running pod repo update before pod install. Include LLDebugTool wherever you need it with #import "LLDebug.h" or you can write #import "LLDebug.h" in your .pch in your .pch file. 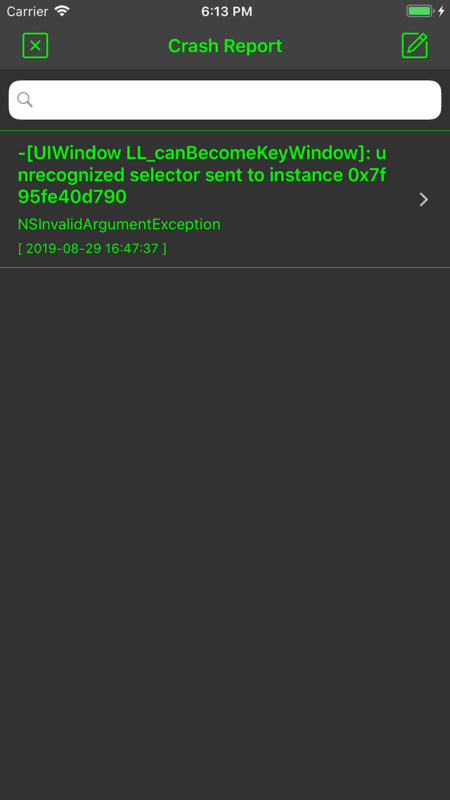 Add a pod entry for LLDebugToolSwift to your Podfile pod 'LLDebugToolSwift' , '~> 1.0.0', If only you want to use it only in Debug mode, Add a pod entry for LLDebugToolSwift to your Podfile pod 'LLDebugToolSwift' , '~> 1.0.0' ,:configurations => ['Debug'], Details also see Wiki/Use in Debug environment. If you want to specify the version, use as pod 'LLDebugToolSwift' , '1.2.2' ,:configurations => ['Debug']. Must be added in the Podfile use_frameworks!. Install the pod(s) by running pod install. If you can’t search LLDebugToolSwift or you can’t find the newest release version, running pod repo update before pod install. Include LLDebugTool wherever you need it with import "LLDebugToolSwift. Run carthage to build the framework and drag the built LLDebugTool.framework into your Xcode project. Run carthage to build the framework and drag the built LLDebugToolSwift.framework into your Xcode project. Alternatively you can directly add the source folder named LLDebugTool. to your project. Open your project in Xcode, then drag and drop the source folder named LLDebugTool. When you are prompted to "Choose options for adding these files", be sure to check the "Copy items if needed". If you want to use only one module ,see WikiUse Components. Integrated FMDB to your project,FMDB is an Objective-C wrapper around SQLite. Download the LLDebugTool latest code version or add the repository as a git submodule to your git-tracked project. Download the LLDebugToolSwift latest code version or add the repository as a git submodule to your git-tracked project. Open your project in Xcode, then drag and drop the source folder named LLDebugTool and LLDebugToolSwift. When you are prompted to "Choose options for adding these files", be sure to check the "Copy items if needed". If you want to use only one module ,see WikiUse Components. Include LLDebugTool wherever you need it with import LLDebugToolSwift". You need to start LLDebugTool at "application:(UIApplication )application didFinishLaunchingWithOptions:(NSDictionary )launchOptions", Otherwise you will lose some information. If you want to configure some parameters, must configure before "startWorking". More config details see LLConfig.h. // The default color configuration is green background and white text color. // Write your project code here. // Use this line to start working. // Uncomment one of the following lines to change the color configuration. // Use this line to tag user. More config please see "LLConfig.h". // Uncomment one of the following lines to change the window style. // Uncomment this line to change the available features. Print and save a log. More log macros details see LLLogHelper.h. // Insert an LLog where you want to print. // Insert an LLog_Error_Event where you want to print an event and level log. You don’t need to do anything, just call the "startWorking" will monitoring most of network requests, including the use of NSURLSession, NSURLConnection and AFNetworking. If you find that you can’t be monitored in some cases, please open an issue and tell me. You don’t need to do anything, just call the "startWorking" to intercept the crash, store crash information, cause and stack informations, and also store the network requests and log informations at the this time. 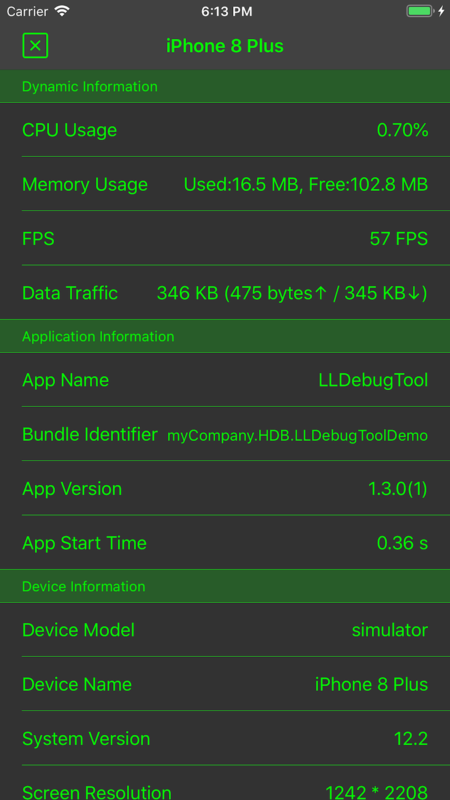 LLDebugTool monitors the app’s CPU, memory, and FPS. At the same time, you can also quickly check the various information of the app. 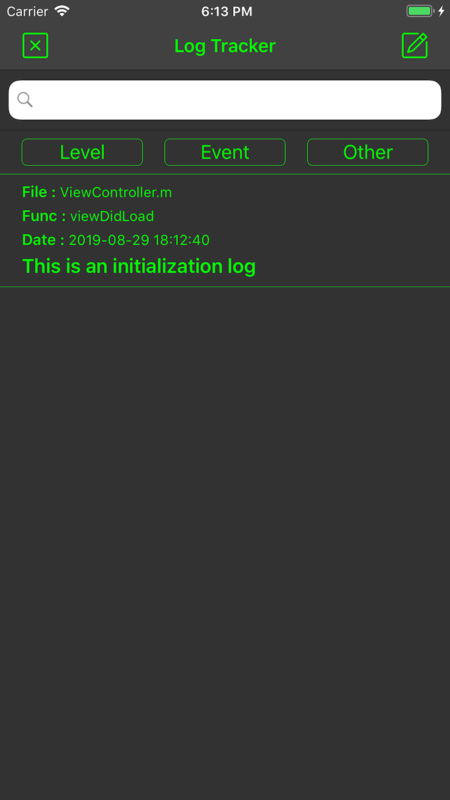 LLDebugTool provides a quick way to view and manipulate sandbox, you can easily delete the files/folders inside the sandbox, or you can share files/folders by airdrop elsewhere. As long as apple supports this file format, you can preview the files directly in LLDebugTool. You can get more help by looking at the Wiki. You can download and run the LLDebugToolDemo or LLDebugToolSwiftDemo to find more use with LLDebugTool. The demo is build under XCode9.3, ios 11.3 and cocoapods 1.5.0. If there is any version compatibility problem, please let me know. You can refer it to the pch file. To start and stop LLDebugTool, you need to look at the "LLDebugTool.h". For the custom color , size , identification and other information. If you want to configure anything, you need to focus on this file. If you’re not interested in how the functionality works, you can ignore this folder. Each component folder is divided into Functionand UserInterface, Function is the specific function implementation, UserInterfaceis the specific UI build. AppInfo Use to monitoring app’s properties, depend on General. 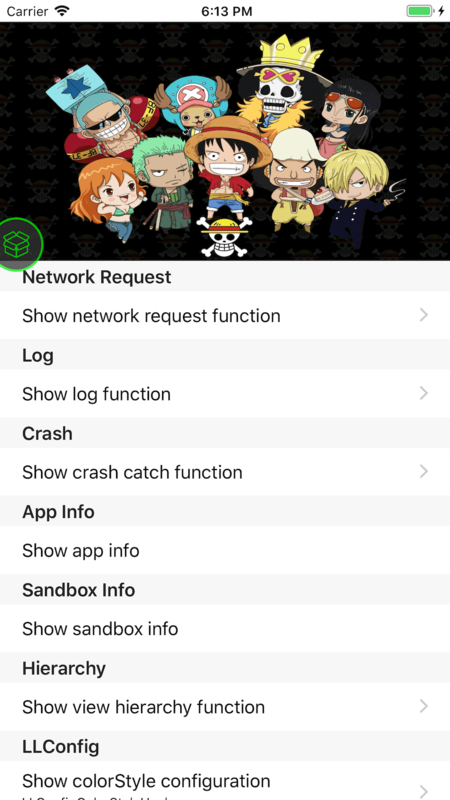 Crash Used to collect crash information when an App crashes, depend on LLStorageManager. Log Used to quick print and save log, depend on LLStorageManager. Network Use to monitoring network request, depend on LLStorageManager. Sandbox Used to view and operate sandbox files, depend on General. Screenshot Used to process and display screenshots, depend on General. LLStorageManager Used to data storage and reading, depend on General. General The basic component of other components, depend on Config. If you need help, open an issue. If you’d like to ask a general question, open an issue. If you find anything wrong or anything dislike, open an issue. If you have some good ideas or some requests, send mail([email protected]) to me. A brief summary of each LLDebugTool release can be found in the CHANGELOG.